This is proof that excellent steam action need not involve railways! 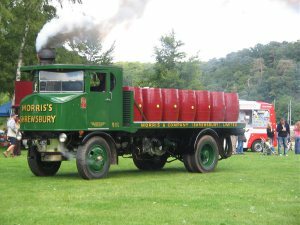 This years vintage Traction Engine and Steam Roller event The Rally in the Valley takes place 18-19 July 2015 at The Edgar Davies Rugby Ground, on Severn Park, Bridgnorth. The Rally in the Valley originally began in 2008 as the public launch of the Trevithick Replica Engine CATCH ME WHO CAN, which was built in Bridgnorth by the Trevithick 200 Charity to celebrate the bicentenary of the original engine being built at Hazledines Foundry, Bridgnorth in 1808 by Richard Trevithick and John Urpeth Rastrick. The Rally-In-The-Valley features an array of exhibits such as Traction Engines, Steam Rollers, Vintage Fairground Organs, Showman’s Engines, barrel Organs, Steam Engines, Vintage farm machines Stationary engines and vintage tractors, courtesy of Bridgnorth Vintage Machinery Club, including Bob Atter’s rare 1965 Massey Ferguson 2130. 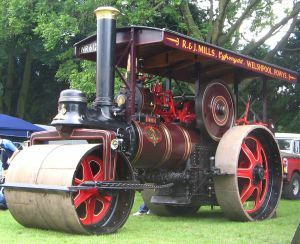 Of which Only 100 were manufactured plus Threshing Machine demonstrations. 22/07/2015 in Reblogs, Severn Valley Railway.